All students, grades 9-12 registered through a sponsor with regional coordinator. The written test and questions for the oral rounds will be provided by the Law-Related Education Department. All participants compete on a multiple-choice test administered by the contest proctor. They have a total of thirty minutes to complete the exam. The proctor can admit late arrivals to the written exam, but must collect their papers at the same time as the other students. Students who arrive late may not make up missed time. Students will be allowed to see their multiple-choice test once the oral round is complete and under the supervision of a contest official. Students will not be allowed to take the test from the competition site. All students then participate in four oral rounds. One round focuses on current events questions, while the other three rounds are based on material in The Texas Bee Study Guide excluding civic values and skills. Students have 60 seconds to give a substantive answer. Time starts as soon as the question has been read. Contestants may request that the moderator re-read all or part of a question or spell a word, but this is part of the 60 seconds. Students must listen carefully to the oral questions. 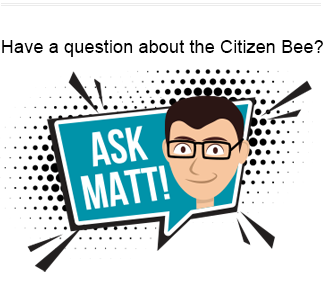 If the moderator asks for a student to give the name of a person, they must give the full name as it is cited in the Texas Citizen Bee Study Guide (website, app, or the PDF copy) for the answer to be correct. The citations in the guide sometimes include middle names, initials of middle names, or surnames for clarity. Examples include the following: if the answer is “John Quincy Adams,” “Adams” or “John Adams” would both be incorrect as it is John Quincy Adams in the guide; if the answer is “John F. Kennedy,” JFK or Kennedy would not be correct; if the answer is Martin Luther King, Jr, Dr. King, Martin Luther King, OR MLK would not be correct. LANDMARK SUPREME COURT CASES/CIVIC VALUES AND SKILLS AND CURRENT EVENTS: For questions in the ORAL COMPETITION, students will not be required to give the name of a case (for example Texas vs. Johnson) but rather will be asked questions related to the content of the case. Note: We have identified specific cases for the regional written and oral competition. Students must speak loudly and clearly into the microphone. Judges CANNOT ask students to repeat or clarify an answer. “I don’t know” is an acceptable answer. During the oral rounds, if a student must leave the contest area for any reason, he or she must see the competition coordinator. There is to be NO TALKING OTHER THAN INTO THE MICROPHONE WHEN ANSWERING A QUESTION DURING THE ORAL ROUNDS. For an appeal based on an oral question. Only a contestant may lodge an appeal, and only on an answer he or she has given. Appeals must be filed with the appeal judge after the judges’ decision on his/her answer. Contestants forfeit their right to appeal if they do not proceed directly to the designated appeal area from their seat or the stage, or if they communicate with anyone prior to filing the appeal. Contestants complete an appeal form and give it to the appeal judge. The appeal judge decides whether an oral appeal warrants review by the panel of three judges. If the appeal is denied, the form is returned to the contestant with an explanation. If the appeal warrants review, it is presented to the panel of voting judges. The contestant remains in the appeal area until the judges reach a decision. During the oral rounds, the judges call a time-out to discuss an appeal. The judges decide the outcome of an appeal before the affected contestant’s next turn in the following round. Appeals based on the written component are not allowed. As previously stated, students will be allowed to review their written test to ensure that it was graded correctly and to note the correct answers before the end of the competition. NO REFERENCE MATERIAL OR ELECTRONIC RETRIEVAL SYSTEMS MAY BE USED DURING THE WRITTEN AND ORAL ROUNDS OF THE COMPETITION. Audio /Video Taping and Pictures. No audio or video taping or still pictures will be allowed during the regional or state competitions, with the exception of taping done and pictures taken by competition organizers. The judges and scorekeeper use the following procedures to resolve ties in award-winning places, or to determine who advances. The student with the higher score in the overall written component is declared the winner. If the tie remains, proceed to Step 2. The student with the higher score in Section 4 of the written component, which contains more complex questions, is declared the winner. If a tie remains, the judges proceed to Step 3. The student with the higher score in Section 3 of the written component, which contains more complex questions, is declared the winner. If a tie remains, the judges proceed to Step 4. In the unlikely event that a tie is unresolved, the prizes are added together and divided between the tied students. For example, in a tie between the first and second place winners where the first place winner receives $100 and the second place winner receives $50, each receives $75. In a case where advancement to the next level is involved, both are declared first-place winners and both students advance. Should follow the procedures given to them in specific role Instructions and are to refrain from adding editorial comments to the questions being asked. If, at any point, a student is disruptive, exhibits unsportsmanlike conduct, or is coached from the audience, that student is immediately disqualified from the competition by the competition coordinator.